Pohatu was the cheerful and brave Toa Mata of Stone and part of the team tasked with awakening the Great Spirit Mata Nui. After being exposed to Energized Protodermis, he was transformed into the Toa Nuva of Stone. Pohatu and the rest of his team were created on the island of Artakha. From there, they were transported to Daxia and awakened. The Toa were immediately introduced to each other and told by Helryx of their destiny to be the guardians of the Great Spirit Mata Nui. The Toa were then trained by Hydraxon in combat, and other situations that they might encounter. He once hid each of their Kanohi, and they would have to retrieve them. 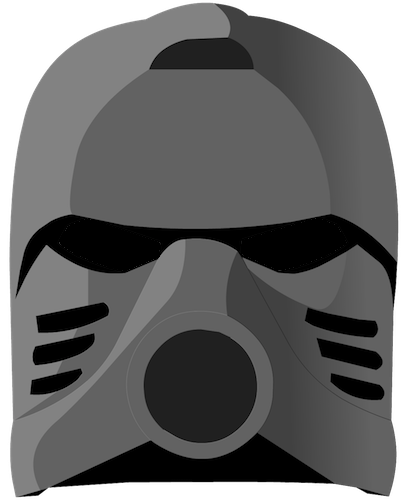 He claimed the exercise was to train them for a time when Kanohi would not be readily available. Directly afterwards, he had each of them try to escape Spinax, Hydraxon's Energy Hound. Pohatu, like his teammates, could not outrun the Rahi, even with the Kanohi Kakama; the moment he deactivated it, the hound caught him. Upon completing their training, the Toa Mata were sent to Karda Nui to protect its Av-Matoran residents. They fought against many Rahi that had been affected by strange energy spikes, and then defeated the living lightning bolt Rahi, the Avohkah. Following the Avohkah's defeat, Tahu and Kopaka led the other Toa to the Codrex, the only feature on the sandy plains of Karda Nui. After they entered it, the hatch sealed them inside, and the two Toa were forced to explain that if they left the Codrex, the Energy Storms that filled Karda Nui would destroy them. They were told they had to enter Toa Canisters, since the Codrex had no life support systems. Pohatu was the first to enter them, where they remained for thousands of years. The Toa Canisters were supposed to travel to the island of Mata Nui. When they landed, they were supposed to go to the island temple, Kini-Nui, head through the tunnel system into Metru Nui, and awaken Mata Nui. However, an unknown anomaly caused the canisters to malfunction, and they floated aimlessly in the sea for a thousand years, until a Matoran named Takua collected the Toa Stones of the island and inadvertently summoned the canisters to Mata Nui. After awakening and emerging from his canister, Pohatu found his way to the village of Po-Koro. Suffering from amnesia much the same as the rest of the six Toa, Turaga Onewa had to explain who Pohatu was, the current chaotic situation on Mata Nui, and the destiny of the six Toa. Following this, Pohatu went off to practice his skills, meeting Kopaka after accidentally burying him in a rockslide. Pohatu offered to help him out from the rubble, but Kopaka preferred to escape on his own, using his Ice powers to weaken and shatter the stones around him. Pohatu came to enjoy Kopaka's company, and despite the Toa of Ice's reluctance was able to convince Kopaka that they should travel together. They ascended the mountain to its peak, where Kopaka found a Kanohi Hau. From the summit, Kopaka was able to see the other four Toa, and the Toa Mata were able to finally reacquaint themselves with one another. Along with the rest of his fellow Toa, Pohatu first had to collect eleven Kanohi Masks and a Makoki Stone. Journeying to Po-Koro, Pohatu arrived upon the outset of a plague. Takua investigated the village and found the source of the plague to be a secret chamber in the Po-Wahi Quarry where the Po-Matoran Ahkmou was obtaining his famous Comets. Pohatu arrived shortly after Takua, and prepared to fight the Nui-Jaga which guarded the chamber. However, the Rahi hurled a gob of blinding venom at him, forcing him to rely on Takua's instructions on where to kick Kolhii Balls. Together the two brought down the supports that kept the cavern from crumbling, just in time for Pohatu to regain his vision and evacuate using his Kanohi Kakama, Takua in hand. He later acquired a Kanohi from infected Nui-Rama, defeating the creatures with his fellow Toa by knocking the Rahi's infected masks off. Having trouble finding their masks individually, the Toa Mata called a meeting, where they discussed an alliance. Teridax took advantage of their union and attacked them, unleashing several forces of nature against them. As Rahi attacked, Pohatu saw two Tarakava ambush Tahu, and kicked a stone his way. Tahu sliced it in half, the halves hitting the Tarakava's heads. The Toa decided to work together, and Pohatu accompanied the Toa in locating their masks together, Lewa securing one of his masks. Upon completing the quest for his eleven Kanohi and the Makoki Stone, Pohatu met with the rest of the team at Kini-Nui and received Golden Kanohi. After instructing the Chronicler's Company to guard Kini-Nui, they then descended into Teridax's lair, where they merged into Toa Kaita, and battled to defeat the Manas crabs. Dissolving into their original forms, the Toa were confronted by six Shadow Toa, malevolent counterparts to themselves. After realizing that the Shadow Toa were manifestations of their own darkness, the Toa Mata absorbed them, and entered Teridax's chamber. The Makuta confronted them in the form of a Matoran, to confuse them about their destiny. Refusing to fall for the trick, the Toa unleashed their elemental powers, defeating him for the first time through their combined strength. They were then teleported back to the Kini-Nui. Immediately after their victory, the island came under attack by the Bohrok Swarms. The Mata travelled to Ta-Koro which was being attacked by Bohrok. During the fight, Pahrak attacked Pohatu until the Bohrok were all defeated and Vakama gave them the task to take Krana. Pohatu returned briefly to his home village of Po-Koro, only to find it under attack by the Bohrok. After briefly fighting Pahrak and Lehvak away from Po-Moro, Pohatu left just as a Tahnok swarm arrived. He returned, saving Hafu, but was forced to evacuate the village, which relocated to Ga-Koro. Pohatu, teaming with Gali, constructed a trap in Po-Wahi, and managed to retrieve many of the Krana that they needed. As Gali dove into Tiro Canyon in the trap, Pohatu levitated out. After they had finished, a Gahlok swarm attacked. After retrieving one of each breed of Krana, Pohatu and the five other Toa descended into the lair of the Bahrag, queens of the Bohrok. Pohatu realized that the tunnels they were in were too perfect for Matoran or Bohrok to make. The Toa reached a wall that Pohatu and Onua could not break down. When the Toa realized it was an illusion, they pressed through. The Toa's presence triggered the revelation of six Exo-Toa suits, which the Toa used to fight the Bahrag with the suit's Electro-Rockets. Pohatu and Onua fought illusions created by Cahdok, but Tahu realized that to win the Toa need to shed the Exo-Toa. Shedding the armor, the Toa used their elemental abilities to trap the Bahrag in a Protodermis Cage. As the Bahrag's lair began to collapse, the Toa fell into six tubes filled with Energized Protodermis. This mysterious substance transformed the Toa into Toa Nuva. The Toa emerged in a cavern to find stone raining down, but the Hau Nuva saved them. As the cavern began to crumble, Pohatu and Lewa lent the power of his Kakama Nuva and Lewa's Miru Nuva to the other Toa to help them escape. In another chamber, the Toa saw Tahnok rampaging without the Bahrag guiding them. Defeated by the Pakari Nuva and the power of Ice, they were trapped in a ditch. The Toa then flew to the surface, where they had a mock battle and went their separate ways, despite Gali's protests. When the Bohrok-Kal stole the Nuva Symbols, Pohatu lost his powers along with the other Toa Nuva. Later, he encountered Gahlok-Kal, who magnetized him to a herd of Mahi until Takua, Tahu, and Jaller found him. He and the other Toa Nuva then began their quest to obtain the Kanohi Nuva, during which Pohatu and Onua tried to seize the Krana-Kal off of Tahnok-Kal. The two were successful, but a Bohrok Va managed to put another Krana-Kal in, allowing the Tahnok-Kal to get away before they noticed. He was told by Onewa that there was a Kanohi Hau Nuva in an Ice cave on Mount Ihu. He headed there and attempted to team up with Kopaka, continuously falling in the drifts, and even causing an avalanche. He eventually got Kopaka to agree to team up, when he saved him from a Muaka. After they reached the cave, he cleared the cave mouth from rocks with ease, and continued, going down onto a crevice to find the mask. They found the mask, but a tremor came, and Pohatu tried to shove Kopaka out of the way, Kopaka then grabbed the Hau Nuva, and tried to use it to shield Pohatu from the oncoming boulders. Pohatu was rendered unconscious and was covered by the rocks, and Kopaka thought him dead. He eventually woke up, and traveled through the tunnels until he wound up in Po-Wahi. He then set off to Po-Koro, and witnessed Kopaka giving Onewa the Hau Nuva, as a tribute to the "fallen" Toa of Stone. After letting Kopaka know that he was actually alive, and seeing Kopaka show some actual emotion, he took the mask. At one point in searching for Kanohi Nuva, Pohatu, Onua, Lewa, and Vakama became trapped in the lair of the Rahi Nui in the Place of Shadow. The Rahi Nui attacked, but the Toa were largely unsuccessful, until Vakama taunted it. The Rahi Nui, recognizing Vakama's voice (as Vakama had fought the Rahi Nui as a Toa), charged the Turaga in anger. Vakama moved out of the way, and the Rahi Nui's horns were lodged in the wall. Teridax then released the Toa Nuva and Vakama. Pohatu and the other Toa Nuva journeyed to the Bahrag's lair, following the Kal. After Tahu managed to slow the Bohrok-Kal down slightly with the Kanohi Vahi, the Nuva were able to catch up and they transferred their powers in the Nuva symbols to the Kal. It was so much power that the Bohrok Kal were overloaded and defeated by their original powers. The Toa Nuva regained their Elemental Powers and headed back to the surface. After the Kolhii Tournament, Pohatu, Gali, and Tahu were present when the Mask of Light was discovered, and being translated. He left for Onu-Koro shortly thereafter. While questioning Takua on Jaller's whereabouts, part of the cave imploded, and a Vorahk, Kurahk, and Turahk entered Onu-Koro. After some struggles, the Vorahk fought Onua, who started to drain his power. Pohatu ran to save Onua, but the Turahk shot a beam of fear, causing Pohatu to freeze in fear. Pohatu managed to recover and used his Climbing Claws to hold the Turahk in place, while Onua collapsed the roof above them. They both ran out to the surface, where they were buried alive. Kopaka later saved them, and the trio went to the Kini-Nui, where they fought the Rahkshi. Pohatu used his climber claws to cuff the Vorahk and Kurahk, while Tahu, Onua, Kopaka and Gali finished them off. After Takua became Takanuva, Pohatu helped in the construction of the Ussanui. After Teridax was defeated, the Turaga related the history of Metru Nui to the Toa Nuva and Matoran. Afterwards, they constructed boats and made their return to the island-city. When they arrived, the Toa Nuva faced six Doom Vipers, and were able to defeat them using the Kakama Nuva. Afterwards, Pohatu helped with the reconstruction of the city. Some time later, the Toa Nuva and the Turaga were immediately invited to a secret meeting of Dume's. There, he along with the other Toa learned that the one they sworn to awake, Mata Nui, was dying, and his only hope was the Mask of Life which was located on Voya Nui. Pohatu and the other Toa set off to this mysterious island in Canisters similar to the ones they arrived on Mata Nui. Upon arrival, they met with the Piraka, and a fight broke out. One by one, Pohatu witnessed his fellow Toa fall. Pohatu was later knocked out by Hakann, leaving Onua the only one left fighting, but he was eventually felled as well. Zaktan, the leader, did not dare to leave them alive, so he ordered his fellow Piraka to remove the Toa's tools and masks, and then throw them into Mount Valmai. The volcano erupted before the Piraka could do so, and the Toa Nuva escaped. However, they were attacked by a confused Voya Nui Resistance Team, who believed them to be more Piraka. Balta (Who had been freed from a cave by Axonn and informed of the Nuva) stopped his friends. The twelve heroes were knocked out after retrieving their masks by Brutaka. Pohatu was then rescued by the Resistance Team, and, alongside the other Toa Nuva, set off to a new mission: prepare the universe for Mata Nui's awakening. With the rest of the Toa Nuva, Pohatu worked to complete the Scroll of Preparations. He helped re-release to Bohrok to level the island of Mata Nui. After this, the Toa Nuva traveled to Odina to retrieve the Staff of Artakha. Instead, they found the Shadowed One, who told them the Staff had been given to the Vortixx on Xia as payment. In exchange for this, he asked to Toa Nuva to kill the traitorous Roodaka, an ignored request. Before leaving, Pohatu set the stones of the Dark Hunter base to spontaneously collapse an hour after the Toa Nuva left the island. Arriving on Xia, the Toa Nuva captured Roodaka and witnessed the fight between the Tahtorak and the Kanohi Dragon. At the Toa Nuva's request, Roodaka de-mutated the Rahaga back into Toa Hagah. Shortly after this, the Toa Nuva departed to Karzahni in order to combat the member of the Brotherhood of Makuta who had stolen the Staff, Icarax. Once there, Pohatu and the others, except for Gali, were defeated by an ambush of Icarax's. After Gali destroyed the realm, Pohatu was revived and was assigned a mission to retrieve an artifact called the "Heart of the Visorak" with Onua. He was then teleported by Botar to Daxia where he saw the Staff of Artakha being used to restore the Universe to its former aspect. After completing their missions, the Toa Nuva arrived on Artakha and stayed long enough to gain new armor from the realm's ruler. They were then transported to Karda Nui. After arriving in Karda Nui, the Toa Nuva found a team of Av-Matoran fleeing from three Makuta. Pohatu charged into the battle, and after a brief fight, both sides retreated. The Nuva split into two teams: Lewa, Pohatu and Kopaka as one team, while Gali, Onua and Tahu as another. Pohatu's team, led by Kopaka, remained with the Av-Matoran to defend the Stalactite Villages from the Makuta's assault. Curious to what their new Midak Skyblasters could do, he shot a ball of light from it which hit Antroz. The Toa Nuva then questioned the Av-Matoran about where they were and who had just attacked them. Pohatu and Photok later spotted Radiak, who stated (as bait) that he had stolen the Makuta's battle plans and was injured. Antroz then blasted a bolt of shadow at Photok, and Pohatu charged at him. Chirox then attacked Pohatu using a Shadow hand, grabbing him and letting him fall to the ground. He, Photok, Kopaka and Solek were later bound in shadow chains, hanging from the ceiling of Karda Nui by Antroz. Lewa then arrived and shot a light ball at him, waking him up. The Toa of Air then opened fire on Antroz, breaking his concentration. Pohatu managed to catch Kopaka and Solek, while Lewa caught Photok and escaped. Later, the Toa captured Kirop and stole the second Keystone from him. They then tricked him into leading the Toa to the Shadow Leech Hive. Along the way, the Toa Ignika saved them from an attacking Rahi and joined them. When they reached the hive, Kopaka and Solek stayed to confront Mutran while the others searched the Hive for the vats containing the Shadow Leeches. They accidentally passed the vats, which were cloaked in an illusion of Mutran's, and found that Toa Ignika had been replaced by a gigantic Rahi. They attacked, but the Toa Ignika struck back. Pohatu managed to stop the Toa, recognizing his mask, realizing that it was the Ignika. Suddenly, the five were attacked by Antroz, Chirox, and Vamprah. When they woke up, Mutran attempted to drain Lewa's light, but Pohatu rescued them. The four Toa and three Matoran sped out of the hive using Pohatu's Kakama Nuva, pausing only to destroy the Shadow Leech vats. The Makuta launched a counterstrike, destroying the last Stalactite Village, but the Toa Nuva and Av-Matoran had already fled. The Toa then stole the third Keystone from the Makuta's base and confronted them. In the battle, Photok and Pohatu were almost killed by Icarax's Gravity power, but Toa Ignika defeated Icarax in time, releasing the two from Icarax's power. The five Makuta retreated to the Swamp of Secrets, and the Toa followed, fearful for their friends below. Pohatu, Lewa, and Kopaka arrived in the swamp just as Antroz was about to fire a shadow blast at the Mistika Toa Nuva. Kopaka froze Antroz's hand and the Toa Nuva reunited, and then prepared to fight the final battle against the Makuta. During the first battle, Pohatu and Photok were up against Gorast, who used her Felnas on him, making his stone powers go out of control. He and Photok were buried under tonnes of rock, and he was knocked out. Sometime later, Photok woke him up and Pohatu used his powers to mentally lift the rocks away. The duo then flew off. Soon after that, he was spotted by Takanuva and Gali while flying through the swamp. As they flew to find the others, they encountered a group of Niazesk, heading in their direction, readying to attack. Pohatu attempted to knock some down with his Stone powers, but they easily evaded his efforts. When Takanuva used a Shadow blast to defeat the Niazesk, Pohatu started to suspect that Takanuva was Teridax in disguise and gave him ten seconds to prove he was Takanuva before he attacked. After Gali formed a mental link with Takanuva and proved that he was who he claimed to be, Pohatu accepted it. Pohatu, Gali, and Takanuva later regrouped with the other Toa, learning of the energy storms and the Ignika's countdown to the end of the universe. After a battle with the Makuta, the Toa Nuva entered the Codrex, eventually discovering three powerful vehicles. Pohatu claimed the Rockoh T3 for himself, and later flew it in combat against the Jetrax T6, which had been hijacked by Antroz. Antroz shot him down, and engaged the Axalara T9 in combat. Pohatu managed to return to the dogfight, as he and Lewa were prepared to ram into the Jetrax T6. Antroz had then teleported out, and only Kopaka noticed. He released barriers of ice around the two vehicles to stop them, and he jumped into the Jetrax T6 in time. Later on, Tahu rounded up all the Toa to flee from Karda Nui as the Energy Storms were erupting. Using the three super-fast vehicles, the seven Toa made it out of Karda Nui in time. Pohatu had noticed the Ignika flying during the journey, but then it disappeared. The Toa Nuva flew to Metru Nui, where they discovered the city being invaded by the Brotherhood. Using the vehicles, they destroyed the surrounding fleet. Their arrival boosting the morale of the Order of Mata Nui warriors and Toa Mahri protecting the city, and they were able to drive off the invaders. Afterwards, they celebrated the awakening of Mata Nui in the Coliseum. However, the celebrations were halted when Teridax revealed he took over the body of Mata Nui, and thus controlled the Matoran Universe. After fleeing the Rahkshi attacks on Metru Nui via tunnels that Krahka showed the Toa Nuva whilst they were hiding in the Archives, the Toa Nuva arrived on the island of Stelt. There, Tahu formulated a plan to cause havoc around the Matoran Universe to distract Teridax's consciousness. Trinuma found the Toa and informed them of Daxia and the Order of Mata Nui's demise. Shortly afterward, Pohatu journeyed to Destral with Takanuva, where they found the island in ruins. Upon their arrival, Pohatu went about searching for any useful weaponry. Pohatu later escaped from the Matoran Universe, and along with Gali, participated in the Battle of Bara Magna and wiped out half a legion of Skakdi. The battle ended with a victory, Teridax was killed and Spherus Magna was reformed. During efforts to help the Matoran Universe inhabitants adapt to Bara Magna, he encountered Kopaka, and the two worked together to create a shelter for those still working. They were soon approached by Toa Lesovikk, who was enraged that the tyrant Karzahni had escaped, and eventually left to search for him. Pohatu and Kopaka set out the next day to find Lesovikk. Pohatu used his Kakama Nuva to search the area and discovered the corpse of Karzahni, as well as Lesovikk's weapon, leading the Toa to suspect that Lesovikk had violated the Toa Code. They noticed the onset of a cyclone, which Kopaka attempted to stop solely with his Ice powers. Ignoring his brother's adamant nature, Pohatu used his Kakama Nuva to create a reverse flow of the cyclone, dissipating it. Kopaka revealed that the cyclone was natural, not an attack, due to its single direction. They collected Karzahni's body, and returned to their camp, where they spoke with the recently returned Tahu and Gali, who had seen Lesovikk during their search for a New Atero. Pohatu and Kopaka set out again the next day, following Tahu's directions. Along the way, they talked about Lesovikk's motives, and Pohatu expressed an understanding of Lesovikk's actions, though Kopaka still condemned them. Kopaka later discussed alternate theories to the crime, and the two Toa were suddenly struck by an agonizing mental scream, which revealed the death of Tren Krom. The two quickly discovered Tren Krom's remains, scattered about a forest. They soon encountered a mutated Matoran, Gaardus, who informed them that Tren Krom's killer had escaped after attacking him. Gaardus related his history of being altered by the Nynrah Ghosts, and also mentioned the Red Star. Revealing an ability to get up to the star, Gaardus took Kopaka and a wary Pohatu up to the Red Star, where they encountered a group of hostile Kestora. The Kestora were disarmed by Pohatu when they tried to attack and suggested that the Toa be sent to the island of Mata Nui, to which they revealed the Great Spirit Robot was in ruins. Gaardus disappeared as Kopaka promptly froze the bickering Kestora, and the Toa began to search for an escape route off the Red Star. The two were driven into a trap by surrounding inhabitants, but were lead to a safer area by Mavrah. In the Toa Empire Alternate Universe, Pohatu, along with the other Toa Mata, were placed into Toa Canisters to prepare for the day when they would be called upon in and act as the failsafe for the Great Spirit, like they were in the main universe. However, since the Great Spirit Mata Nui never fell asleep in the alternate universe, no signal was sent which called for the Toa to depart to Metru Nui. Tuyet, however, discovered a spot in the Coliseum which nobody knew about, and was able to fake a signal which summoned the Toa to Metru Nui. There, the Toa told the Toa Mata about how the Brotherhood of Makuta and the Dark Hunters were taking over, and that the empire stopped the groups. The Toa Mata decided to follow her rule, and Pohatu was given rule of Po-Metru from the Throne of Stone, but he began to have doubts after Tuyet sent a group of Toa to wipe out the Nynrah Ghosts. As a result, he and Lesovikk formed a rebel group which also consisted of Ahkmou, Nuju, Kodan, Darkness, Primal, and Guardian. After Takanuva arrived, Pohatu introduced him to the rest of the group. They then decided to lead an attack on the Coliseum. At the battle's onset, Pohatu created a stone fist to smash the Coliseum's walls. Later on, he cried out in anguish over Gali's death, but continued on into the Coliseum, only to meet Onua and be unable to move past him, with the two being too evenly matched. In this alternate universe, Pohatu attempted to seal off the island of Mata Nui from the Matoran Universe. He and Hewkii were attacked and killed by Rahkshi that smashed through the rocks the two brought down on the tunnels. As a Toa of Stone, Pohatu has the ability to create and manipulate stone, powers that were enhanced when he became a Toa Nuva. As a Toa Nuva, he has the ability to set a timed attack of stone, which he did to crumble the Dark Hunter fortress on Odina. As a Toa Mata, Pohatu wore the Kanohi Kakama, the Great Mask of Speed. This mask more than compensated for his lack of natural speed by boosting his speed dramatically. After Pohatu collected five other masks on the island of Mata Nui, he exchanged his Kakama and these five at the Kini-Nui for a Golden Kanohi with the powers of all six. Toa Mata Pohatu's sole Toa Tools were his Feet Additions. When Pohatu transformed into a Toa Nuva, he was given a pair of Climbing Claws, and his Feet Additions became stronger. He could use his climbing claws for melee combat or as throwing weapons. He could also combine them into the Kodan Ball, which he could kick as a projectile. His Golden Kanohi was replaced with a Kakama Nuva, the Kanohi Nuva of Speed, which let him share his speed powers with others. To make up for losing the powers of his five secondary Kanohi, Pohatu Nuva collected the five corresponding Kanohi Nuva, which still rest on his Suva. Upon receiving his Adaptive Armor, Pohatu gained Twin Propeller-drills and an adaptive weapon, which took the form of a Midak Skyblaster for combat with the Brotherhood of Makuta in Karda Nui. Both the adaptive weapon and the Twin Propellers were stowed away by the Adaptive Armor when Pohatu piloted Rockoh T3. Karda Nui's shields blocked Pohatu's access to the secondary masks on his Suva, so he was forced to rely only on his new adaptive Kakama Nuva and any masks his fellow Toa Nuva choose to share. 8531 Pohatu was distributed with the first release of BIONICLE sets. It contained forty-nine pieces including a two-piece LEGO boulder brick for use with his kicking feature. Pohatu's torso piece appeared upside-down in relation to the other 2001 Toa to move his gear function from moving his arms to his leg, allowing him to kick the boulder. Pohatu could be combined with Tahu and Onua to create Toa Kaita Akamai. He could also be combined with Gali to make the Mata Nui Cow, or with Onua to make a black Fikou spider. This Pohatu could also be combined with Turaga Onewa to build the Dikapi. Instructions were once on the LEGO Club website. 8568 Pohatu Nuva was released in late 2002 with forty-four pieces. This new Pohatu featured Nuva armor, new legs pieces, a new Kanohi, and new Toa Tools. These tools, Climbing Claws, could be combined to form the Kodan Ball via pins otherwise stored on his arms. He also retained his Feet Additions, his Toa Tools from his 2001 form, in silver as opposed to their original tan. His torso configuration and kicking feature remained the same as in his Toa Mata release as well, although one could remove the stabilizing piece attached to his left leg and replace it with a gear otherwise affixed to the back to change the kicking feature to a running feature in which both legs swung alternately. When the gear was attached to the back, it could be slid forward to allow for the kicking feature, or backward to lock the right leg in place for posing. As a promotion for the film, BIONICLE: Mask of Light, Pohatu appeared as one of a set of UK Burger King toys in 2003. This toy depicted Pohatu Nuva as he appeared in the movie and is not compatible with Lego parts. 8687 Toa Pohatu was released again in early 2008 as part of the Phantoka wave. This form featured Pohatu's Adaptive Armor in its sky-adapted form, which was orange instead of the normal brown. Pohatu, like the other Phantoka sets, could "team up" with any of the 2008 Matoran small sets, though he was marketed as being paired with Photok. This version of Pohatu came with sixty-eight pieces including a spring-loaded Midak Skyblaster piece and four silver Zamor Sphere pieces representing spheres of light. If one rotates the piece on the backs of his forearms, Pohatu's Twin Propellers spin, also opening from their drill configuration if they are closed at the time the piece is spun. This Pohatu could be combined with Vamprah and Toa Ignika to form the Niazesk. With the 8941 Rockoh T3 set Pohatu was released in the summer of 2008 in another Adaptive Armor form, as the pilot of the vehicle. This form uses thirty-eight of the set's 390 pieces. It also includes a new form of the adaptive Kakama Nuva, consisting of the original adaptive mask's base with a new, winged visor. "Toa! Hey, that's great. I always wanted to be a Toa. Just one question: what's a Toa?" "In truth it is said that great power can be found in small packages... and that aid can come from places least expected." "You are being given a great honor – to set foot on the island of Artakha. Once we are there, my master will speak with you ... or not ... depending on his whim. He may open his fortress for the first time in millennia and welcome you in – or he may banish you forever without a second thought." "Sounds like a party. When do we leave?" "You know, I've seen things crawl out from under rocks that had more class than you Makuta. And I'm a Toa of Stone – I know rocks." "And we're not going to give him that time ... we're going to do a Pohatu on him." "That's right. 'When in doubt, smash everything and hope you're somewhere else when it all goes boom.'" In Mask of Light, Pohatu is voiced by Trevor Devall. In the prototype stages of BIONICLE, Pohatu was named Kick.